It never occurred to me that people were not collectors of antiques, for me it was a way of life. Throughout my childhood, my family instilled the importance of history and its relationship to the decorative and fine arts. After purchasing my first antique in my early teens, I knew there was no turning back; I was hooked! I felt a great pull to build a career around the study of early American decorative arts. As a history major attending Centre College, my summer internships offered me the opportunity to work with noted scholar and antique dealer Sumpter Priddy III. His guidance shaped my passion by approaching antiques as a reflection of history, not just a mere object. Understanding furniture and art, where it was made, how it was constructed, and the use of dated materials sustained my academic interest. Following college, I attended the University of Kentucky’s Historic Preservation Program. In addition, I was awarded a graduate certificate from the University of Virginia, completing the Museum of Early Southern Decorative Arts regional study program. Being surrounded with likeminded people who had a passion for the academic study of antiques, I began to realize there is so much out there to foster my passion and career. 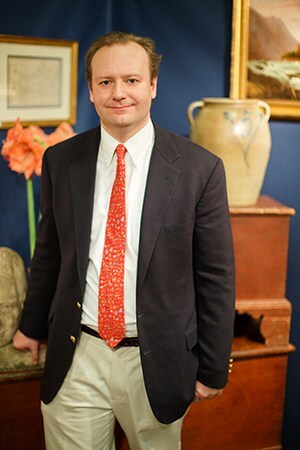 Working for Case Antiques and Auctions in Knoxville, Tennessee helped take my academic study of American art and antiques and apply them within a market perspective. Cataloging, researching, and studying material from several different fields helped to broaden my understanding of the demand and value of decorative and fine arts. In 2013, I established Thistlethwaite Americana, creating a profession where I could share my knowledge and inspiring others to enjoy the excitement of collecting. My plan was to develop a company that honestly represents the pieces it sells. By emphasizing the history, authenticity, and value of each piece I hope to build a lasting relationship with each of my clients. My business’s success is based on integrity and trust. With each client’s acquisition, I hope to instill a sense of pride that motivates them to look forward to the next discovery, and another exciting purchase. With a close eye to aesthetics and quality, I travel across the country finding objects for museums, and both experienced and novice collectors.